Delicious tacos. close to home. Resident Taqueria was born of culinary mind and bred of down-home heart. The vast and impressive culinary experiences of Chef Andrew Savoie span the finest restaurants in America, from New York to New Orleans to Napa, and land here in the Lake Highlands neighborhood of Dallas. We boast fresh, made-to-order tortillas, slow-braised meats, seasonal and local produce, and a margarita that elevates the concept of Happy Hour. Our restaurant is built around the families and friends of this community. Resident Taqueria is a place to gather close to home with a casual atmosphere and a fresh, intriguing take on a cuisine embedded in the history of the area. We seek to embrace and invest in the community of Lake Highlands and everything it has to offer. Resident Taqueria came back again with More Taco awards this year to add to our 2016 award for most interesting taco. This year we were honored with best traditional Taco and Best Veggie Taco! Thanks Tacolandia! Chef Andrew Marc Savoie, a native New Yorker, began his culinary journey after graduating from Baltimore International College in 1997. Eager to begin his professional training under the direction of highly regarded chefs, Andrew headed south to New Orleans to work at Dominique’s at the Maison Dupuy Hotel in the historic French Quarter. Andrew knew from the moment he worked the line at Dominique’s that he had officially embarked upon his culinary career. Andrew’s increasing respect and passion for fine food and dining excellence led him to a series of top-rated restaurants across America: Chef Patrick O’Connell’s famous Inn at Little Washington in Washington, Virginia, Chef Thomas Keller’s French bistro Bouchon in Yountville, California, Chef Rob Evans’ Hugo’s in Portland, Maine, and back to his New York roots where he worked under Chef Jean-Georges Vongerichten at his Three Michelin, Mobil five-star restaurant Jean Georges in Trump International Hotel & Tower. After a move to Dallas, Andrew spent his time inspiring tomorrow’s chefs as Culinary Instructor at The International Culinary School at The Art Institute of Dallas, where he earned awards and accolades from faculty and students. While developing and challenging young professionals, Andrew also achieved his MBA in Hospitality Management, not to mention embarking on family life with his wife Amy and their three amazing children. 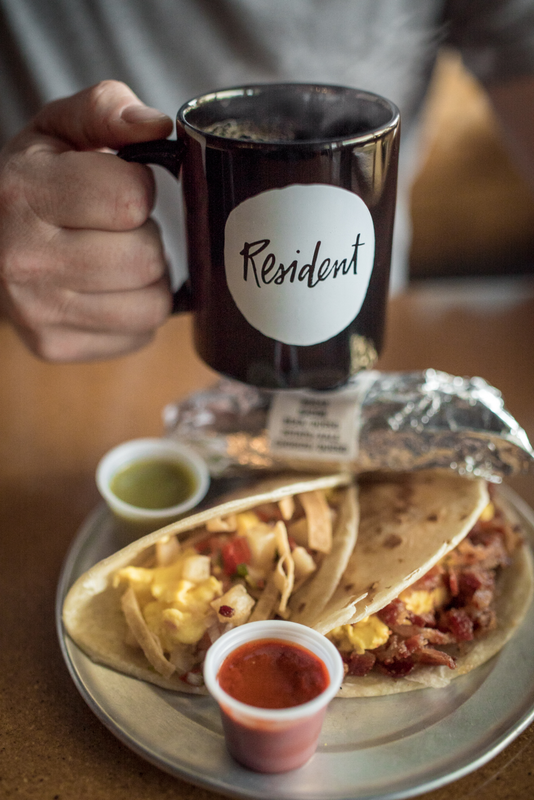 Believe it or not, Resident Taqueria was first going to be a breakfast concept to fill the needs of Lake Highlands residents. But as you all know we first began with lunch and dinner to introduce our elevated tacos. Well the time has come and we are know featuring Grab-n-Go breakfast tacos and more. © copyright 2018 resident taqueria. all rights reserved.